As you know by now, here at GC we speak about five historic core values around which we try to orient our teaching and learning experiences: Christ-centered, Compassionate Peacemakers, Global Citizens, Passionate Learners and Servant Leaders. You can read a short synopsis of each core value with a biblical reference on the Goshen College web site Home Page by clicking the tab “About GC,” then the “Core Values” tab on the right hand side. Clearly, there are almost as many different images of Jesus as there are people with imaginations. What, then, is to keep us from simply creating a Jesus that we find compatible with our own individual tastes? What keeps us from turning Jesus into our “particular Jesus,” who is merely a ventriloquist’s dummy sitting on our laps, saying and doing Jesus-y things according to our whims and wishes? What keeps us from what Charles Hackett of Candler School of Theology calls “sinfully appropriating [Jesus] in the service of our cultural values”? One helpful guide is Scripture, of course. But even then, when we open up the pages of Scripture, we soon discover that even there we find different portraits of Jesus. To begin with, even the title “Christ” is already one major step removed from the very real person, whose Mom and Dad named him Jesus (of Nazareth). In Mark’s gospel, Jesus is portrayed by St. Mark as a miracle worker, full of mystery, not fully aware of his own calling at first (“Messianic secret”). Matthew’s gospel portrays Jesus as a rabbi, a teacher, particularly focused on his Jewishness, written for a primarily Jewish audience, complete with many references from the Older Testament (Jewish Scripture) that prophesy of a coming Jewish Messiah. For Luke, Jesus wines and dines with lowlifes/sinners. Jesus is poor, but fun to be around. He’s a first century party-animal of sorts, or as someone reading Luke described Jesus, “a wine swilling vagrant” (Borg), clearly an outsider, an itinerant preacher who plans his traveling ministry around eating here or there. St. John’s gospel, however, goes to the other extreme emphasizing Jesus’ divine nature. Jesus is the “Word of God, who was with God and was God” from the beginning, now “made flesh,” or as Professor Jo-Ann Brant in her award winning book on the gospel of John describes Jesus, a human actor in a divine drama. Jesus, the ultimate Savior of the whole cosmos. From these same four gospels and other biblical texts, other historians and readers have declared that Jesus was a Galilean peasant, or a middle-class artisan or an apocalyptic prophet, a radical political revolutionary, the ultimate pacifist, the end-time judge and warrior, the wise-sage, the son of God, the son of man, Immanuel, Redeemer, Good Shepherd, Lord, Savior, the new Adam, the King of the Jews, Prince of Peace, God in the flesh, Christ the divine. For over 300 years, the church argued over the various Scriptural claims about Jesus with a relative consensus now articulated in several ancient creeds — though even then, differences remain. Add up the different descriptions of Jesus in the Bible, the ancient creedal claims of who Jesus is, alongside our own varied and personal experiences of Christ and the responses to our question “What does it mean to be Christ-centered?” spin almost out of control. The blood-dimmed tide is loosed . . . Surely, the Second Coming is at hand. . . The down side of this Scriptural flexibility means that we tend to tribalize Jesus according to our own cultural values. Or we tend to read Scripture selectively in accordance with our cultural heritage. So we end up with the Mennonite Jesus, the Catholic Jesus, the Ethiopic Jesus, the Eastern Orthodox Jesus, the Baptist Jesus, the Pentecostal Jesus, the Episcopal, Presbyterian or Lutheran Jesus, or the “evangelical” Jesus or charismatic or nondenominational Jesus. And, we tend to believe that our particular tribal version is the right one or, at the very least, closer to the truth than the alternatives. Standing on the outside looking in on Christianity, an immediate visceral response to all these tribes of Christianity, these denominations or non-denominations, each claiming to be “Christ-centered,” a person might wonder whether “the center” truly holds or not. So, at the very least, whatever else we mean here at Goshen College about being a “Christ-centered” place, our first claim must be a modest one. This does not mean that over the course of your time at Goshen College, we won’t share with you what a GC perspective is or what we mean by the description, “Christ-centeredness.” We will. I am doing that in part today and will further develop this theme, including its relevance for understanding the liberal arts disciplines, in a second talk this fall. 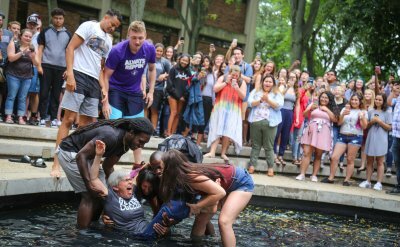 One short-hand version is simply to say, that from a Goshen College perspective, the other four core values provide some nuance, some clarity to the meaning of being a “Christ-centered” campus community. In addition, in a few weeks we will hear from Professor of History, John D. Roth, on what a “naked Anabaptist” or “naked Mennonite” looks like from an historical point of view. I wonder if he’ll bring visual aids to that one. I hope he brings a fig leaf or two along as well. As mentioned, throughout the year, beginning with this Friday’s chapel, Campus Minister, Tamara Shantz will invite us to reflect on what it means to be “transformed by Christ,” something I hope everyone of us will consider strongly while here at GC. I am not too worried, then, that you will not hear the particularity of the Goshen College perspective on what it means to be a “Christ-centered” institution. Indeed, if anything, our temptation might be to claim a bit too much and so tribalize Christ to our own liking or comfort zone as to become a caricature of true Christ-likeness. I hope that does not happen. Having more perspectives in the conversation may help us become more fully Christ-centered. That is my hope. So if Christ-centeredness is first a modest and open conversation about Jesus Christ, to be Christ-centered must also be a threshold for reconciliation, not a wall of separation. If the Apostle Paul is correct in his second letter to the Corinthian church (2 Corin. 5: 11-6:2) that Christ is the great Reconciler who breaks down walls of separation, then one of the most important criteria for assessing the authenticity of Christ-centered claims, is whether or not Christ has, indeed, broken down the walls of separation, the walls of segregation, walls between people who differ from each other, whether because of gender, social, racial, denominational or cultural factors of one kind or another. Such a claim can be quite easily measured by asking the simple question: Are there fewer barriers, walls, obstacles between people who differ from each other by race, creed, culture, gender, denomination, or opinion, today in our churches, in our college and in our community, than there were yesterday? How we answer that question determines, in my opinion, to what degree one can claim to be transformed by Christ. Whatever particularities we claim to have that separate us from each other, it seems to me, that being transformed by Christ will play itself out in a quite generous orthodoxy that lowers the walls of separation to thresholds of reconciliation to step across. Can such a generous, contagious, inclusive “Christ-centeredness” prevail on this campus? 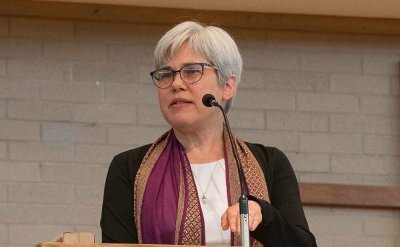 Can Christ really break down the walls that separate Mennonite from non-Mennonite students, staff and faculty? Harder still, perhaps, can Christ break down walls that separate Democratic-leaning students, staff or faculty from Republican-leaning students, staff or faculty? Harder still, perhaps, though it may be a toss up, can Christ break down the walls that separate us by racial, ethnic and cultural prejudices? Can Christ break down walls of separation between people from different social classes, philosophical and religious persuasions as well? I believe so. I have seen it happen here and elsewhere. But I’d still like to put us to the test on just one of those categories. If you are a person from another faith tradition, other than Christianity, we are so glad you are here. I would love to hear from you on how you see “Christ” from outside the historic Christian faith. If I were to guess, I imagine your perspective might even challenge our own easy-belief in Jesus or what it means to claim to be “Christ-centered.” I wonder, for example, whether you see those of us who claim to be Christ-followers truly living the Christ-like life, as you perceive it to be? I’m convinced that those of us who claim to be Christian, if we simply listened, really listened to those of you here from other than Christian faith or non-Christian faith traditions and made a list of your perspectives on what a “Christ-centered” person or college might look like, we might be quite surprised. And then, if we tried to live the Christ-like life described on that list, I am willing to bet that we would be so transformed — so very close (or close enough) to the Christ portrayed in Holy Scripture — that a spiritual awakening, a transformation, might, indeed, spread across this campus and the whole Christian church. Will you help hold us accountable to our claims? Being transformed by Christ can be a wrenching feat for anyone. To be transformed by Christ may require that we reinvent life as we know it. Transformation reshapes caterpillars into butterflies. It converts hell into heaven, changes what is meant for evil into good, turns sinners into saints, and breaks down ancient tribal, cultural, racial, social, and religious walls of separation to mere thresholds of distinction. Transformation requires a rewrite of our stories into a whole new story, little by little, peace by peace. 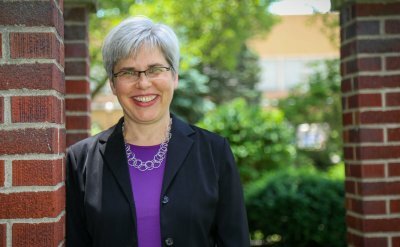 I invite you to join me and countless other Goshen College sisters and brothers across time and space to write an exciting new chapter in the transforming story of Goshen College.